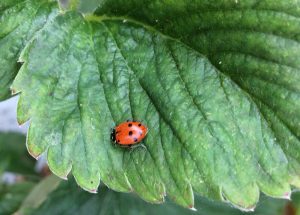 Adult ladybugs are a commonly-recognized biocontrol agent, but there’s so much more to biocontrol! Biocontrol can be an important part of an integrated pest management strategy (learn more about “IPM in a Nutshell”). For example, biocontrol organisms that support plant health can make them less susceptible to the pests that damage them (prevention). If something needs to be applied to reduce pest populations (or keep them low), biocontrol products tend to be less harmful to other critters or people than chemical pesticides (choosing a pest management strategy with low environmental impact). Posts on this blog will explain how biocontrol is already contributing to IPM in New York, and how its use in pest management could be improved. The information is posted by Amara Dunn, Biocontrol Specialist with the New York State Integrated Pest Management Program. If you have questions about biocontrol, you can contact Amara by email (arc55@cornell.edu), call her office (315-787-2206), or leave a comment on this blog.